Want to go treasure hunting at the beach? You’re in the right place! In this article, I’ll explain why many detectors are useless in saltwater environments, along with my 5 best beach detectors. If you're serious about beach detecting, the Garrett ATX Deepseeker is my top recommendation. It's a professional-standard pulse induction machine with a submersible design, outstanding depth and no trouble ignoring saltwater conductivity. It's not cheap, but if you're looking for the best beach detector it's my #1 pick. Saltwater beaches can be a highly rewarding hunting ground - but they present unique challenges to your detector. While the average beginner or mid-range detector can handle most environments, including dry beach sand, saltwater is a different matter. Without the right features and settings, you’ll get endless chatter and few real targets. Many detectors also aren’t submersible, so taking them into even shallow surf can end in disaster. To help you decide on a beach metal detector, this article explains the challenges of saltwater and how some detectors overcome these issues. I’ve also listed the five best beach metal detectors - but make sure you read each mini review to find the right option for you. Why is Saltwater So Challenging? What accessories do I need to hunt at the beach? Saltwater and hot rocks are a constant problem at the beach. The high salt content of sea water amplifies the effects of ground minerals, so land detectors pick up many more false signals. This is a big problem for all VLF detectors - but particularly those with pre-set ground balance. These models have a factory ground balance that reflects the average mineralization across the country. While a pre-set ground balance is fine for most locations, it’s no good in saltwater with high levels of mineralization. There’s really no good way around this issue with an entry-level machine. Lowering the sensitivity may reduce chatter - but you’ll get almost no depth. And just digging everything will result in frustration and wasted time. For this reason, you need a detector that’s capable of ignoring the amplifying effects of saltwater. Of course, if you just want to hunt in dry white sand then none of this applies and almost any detector can do the job. For hunting on wet sand or in the ocean, however, the average entry-level VLF machine is going to provide a frustrating experience. Now you know why many detectors struggle in saltwater, let’s look at some of the features you need for effective beach hunting. I’ve already mentioned that entry-level VLF detectors aren’t suitable for saltwater hunting. Fortunately, more expensive models often have automatic and manual ground balance functions. This is a vital feature of a VLF detector if you’re going to be hunting at the beach. By adjusting the ground balance, you can tune the detector to ignore high levels of mineralization and focus on real targets. Is automatic ground balance enough - or do you need a manual setting? This depends on the detector. Some detectors struggle to automatically ground balance to beach conditions, however, so I recommend models that allow you to tweak the balance manually. This still doesn't mean VLF detectors are the best choice for beach hunting, but ground balance gives you a chance of hitting valuable targets. VLF detectors are also great all-rounders, cost less and provide extensive discrimination options to avoid digging trash. But if VLF detectors aren’t the best choice for beaches, what is? That would be pulse induction (PI) metal detectors. Instead of tuning ground balance to reduce mineralization interference, these detectors simply ignore ground minerals. This allows them to focus on treasure without getting false signals due to saltwater. Another advantage of a PI detector is that they provide excellent depth and sensitivity to small targets. This is why they are considered specialist machines and are popular for gold prospecting. PI detectors are not as versatile or easy to use, however, so if beaches are just one of the places you want to hunt a VLF may be the better choice. Serious detectorists often have multiple detectors for this reason. There’s one other option I haven’t mentioned: a multi-frequency detector. Multi-frequency detectors use VLF technology, but, as the name suggests, can be adjusted to more than one frequency. These models are expensive, but are the most versatile type of detector. A good example is the XP DEUS (see below). This is an advanced detector with four frequencies ranging from 4kHz to 18kHz, so you can balance depth with sensitivity to small objects. So, which type of detector should you choose? If you’re planning on spending most of your time beach hunting, I recommend getting a pulse induction detector. VLF detectors just can’t match a PI model’s depth or ability to ignore saltwater-enhanced mineralization. A PI detector isn’t the right choice for everyone though. PI models can’t discriminate, so they struggle at beaches where there is a lot of iron trash. In this situation, a multi-frequency or single-frequency VLF is probably the better choice. If you want to hunt on land, as well as wet sand, without buying a second detector, a VLF detector is also more versatile. There are big differences between a detector that’s waterproof, weatherproof and submersible. Manufacturers like to throw around these terms, but it’s essential to know a detector’s exact capabilities when it comes to water. A fully submersible detector is completely waterproof. It can be used underwater without the circuitry being damaged - although the maximum depth varies depending on the machine. On the other hand, a detector with a submersible coil is not necessarily fully submersible. Most detectors have a submersible coil, but with a control box that can’t get wet. So, if you see a detector with a “waterproof” coil and “weatherproof” design, you can assume it’s not submersible. 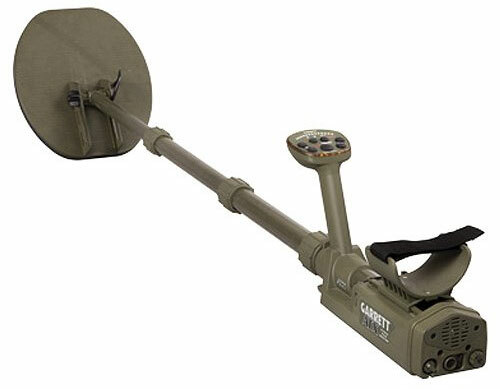 Do you really need a submersible detector for hunting in shallow water though? Technically no, but it’s a ​good idea to get one anyway - especially at the beach. You never know when an unexpectedly big wave could splash your detector. It’s also easy to trip up when wading through shallow surf, as you can’t always see rocks and other obstructions. For this reason, I prefer fully submersible detectors when hunting at the beach. I don’t like the thought of one slip costing me hundreds or even thousands of dollars in equipment! There are exceptions though. If you’re happy to hunt on wet sand when the tide is out and without going intowater, you probably don’t need a fully submersible machine. You still need to handle high levels of mineralization though. In this case, a model like the XP DEUS would be a great choice. It’s also worth considering coil size. Smaller coils are generally more sensitive to smaller targets. They are also easier to use when pinpointing, lighter and have better target separation. For this reason, they are a great choice if there is a lot of trash at your beach that might hide real targets. Bigger coils are heavier and less effective at target separation. They are also more difficult to swing for long periods in water, as there is more resistance due to the larger surface area. There are some advantages though. A larger coil usually provides greater depth, which can help find treasure other detectorists might miss. They can also cover a larger area in less time. In reality, most stock coils are somewhere in the middle of these extremes. And if you’re serious about detecting, you’ll probably want to get a selection of coils to suit different situations and targets. But it’s something to keep in mind when buying. There’s also no “best” option here - you just need to think about the type of target you want to hunt. If you’re not in the best physical shape, a smaller coil might be more enjoyable to use though! Here are my top five picks for a beach metal detector. While I believe all these models provide great performance, make sure you read each review to find out which is the best option for your budget, requirements and experience. 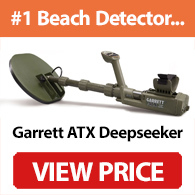 If you’re serious about beach hunting, then the Garrett ATX Deepseeker is my top pick. 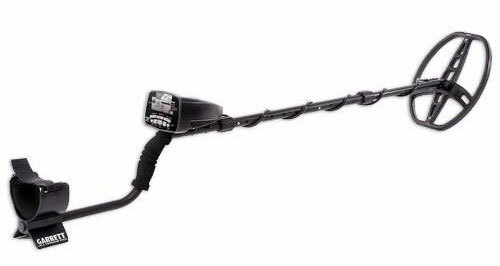 It’s a pulse induction metal detector that can find tiny gold nuggets or jewelry in extreme conditions, so it’s perfect for saltwater. There are two types of package available when buying the ATX: Standard and Deepseeker. If your budget can stretch to the Deepseeker, you’ll get a huge 20” searchcoil for increased depth. This can detect targets up to 18” deep in the right conditions, which is close to double many entry-level or even mid-range detectors. The stock 10”x12” coil still provides excellent depth though - and isn’t as tiring to use. So you won’t be missing out too much if you buy the standard package. There are a few downsides to the ATX though. At 5.5lbs, it’s a heavy detector - especially if you want to use the Deepseeker coil. It’s also expensive. Even so, the ATX is an easy pick for my #1 beach detector. It’s brilliant in saltwater conditions and is highly sensitive to the small targets. If you want the best - and don’t mind paying extra for it - the Garrett ATX is my top recommendation. If you’re looking for a detector that can handle saltwater diving, the Garrett Sea Hunter MkII is my top pick. It’s a pulse induction detector that’s pressurized down to a depth of 200 feet, comes with submersible headphones and provides great sensitivity when hunting. An interesting feature of the MkII is that it has a Discrete Trash Elimination mode. As I mentioned earlier, most PI detectors can’t discriminate trash targets, so this feature can save time and frustration digging unwanted items. It’s also not just a diving detector. The adjustable stem means it’s suitable for use on beaches too - and it does a great job at picking up small targets. The 5.75lbs weight can be tiring when hunting for long sessions though. Along with trash discrimination, the Sea Hunter MkII includes a detection threshold setting and a non-motion all metal mode. There’s also a dial for adjusting the elimination threshold. It’s not the most feature-packed detector on this list, but it provides enough raw detection performance to make up for it. To summarize, the Sea Hunter MKII is an excellent choice for diving - and it can handle beach hunting too. It’s also considerably cheaper than the Garrett ATX or XP DEUS. To recap the models so far, the ATX is a specialist detector designed for the toughest environments, such as saltwater beaches or gold prospecting. It does a great job in these conditions, but it’s not the most convenient for everyday hunting. The Sea Hunter MkII is also primarily a diving detector and lacks some of the comfort and features of land-based models. What if you want an all-round detector that can handle shallow saltwater detecting - but is also suitable for parks, woodland or other common hunting grounds? In that case, I highly recommend the XP DEUS. This is a “next generation” detector that’s probably the most versatile on the market, due to its multi-frequency technology, rapid response time and wide range of search modes. It also has features not found on most models. These include a fully wireless design, regular software updates to add new features, a GOLD FIELD setting for prospecting, and four ground balance modes. Most importantly for this article, the XP DEUS is great at hunting in wet sand. There’s a pre-set “WET BEACH” search mode, but you can adjust the ground balance manually using the “Beach” function. It’s also lightweight. At just 2lbs, it’s one of the lightest on the market and less than half the weight of the Garrett ATX. This makes it perfect for long and relaxing beach hunting sessions. There are a few drawbacks though, including that the DEUS is not fully submersible. It’s fine for hunting on wet sand, but you can’t get the control box wet, so I don’t recommend using it even in shallow water. It’s also more expensive than most VLF detectors - although it justifies the cost with excellent performance and a wide range of features. In summary, the XP DEUS is an advanced machine that’s great for wet sand hunting. It’s also more versatile than most detectors, due to its multi-frequency technology and excellent reactivity. If you want a high-quality all-rounder this is an outstanding model - and the current #1 on my top model list (which you can find here). Another waterproof detector that's worth considering is the Whites TDI BeachHunter Extreme. It’s a submersible PI detector with a maximum depth of 25 feet and excellent detection performance. Like other PI detectors, the BeachHunter is great for ignoring highly conductive saltwater. Whites has also included their dual-tone audio with adjustable volume and threshold, so you'll quickly learn the different sounds. Another useful feature is the adjustable Pulse Delay setting. This lets you change the machine's sensitivity to find small targets at greater depths. Other features include a 12" search coil - which is designed to effectively be two coils in one - and 2-year limited warranty. Most importantly for beach hunting, the TDI BeachHunter provides excellent depth in difficult conditions. It's easy to use out of the box and the 5.2lbs weight means it's not too tiring to swing for long periods. One thing to note about the TDI BeachHunter Extreme is that it's not just for beach detecting - despite the name. 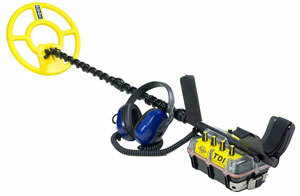 It's really a waterproof version of White's TDI SL, which is also an excellent gold detector. It doesn't have digital target ID, however, so it's not as convenient for land searching. If you're looking for a PI beach detector for hunting in shallow water, the TDI BeachHunter is hard to beat at this price. Note: The BeachHunter Extreme replaces the Tesoro Sand Shark on this list of saltwater detectors, as it's no longer available. If you want a more versatile machine with similar features, the Tesoro Tiger Shark is designed for both saltwater and dry hunting. One of my favorite detectors is the Garrett AT Pro (read my full review here). It’s a versatile model that’s suitable for most environments, including wet sand. The AT Pro is also considerably cheaper than the XP DEUS. Like the XP DEUS, the AT Pro is a VLF detector. It doesn’t have multi-frequency technology - although the relatively high 15kHz operating frequency makes it sensitive to small targets. Importantly for saltwater hunting, the AT Pro has both manual and automatic ground balance. The automatic balancing is quick and easy, although for saltwater you’ll probably need to spend time adjusting it manually for best results. Other features include Garrett’s “Pro” audio mode, notch discrimination and pinpointer mode. It’s also fully submersible down to a depth of 10 feet. It’s not suitable for diving, but for hunting along the shore it’s a great choice. How does it compare to PI detectors in terms of performance though? VLF detectors can’t match PI models when it comes to ignoring saltwater conductivity and maximizing detection depth. Ground balancing allows you to eliminate most chatter in saltwater though. The AT Pro is also much more versatile than the average PI model, so if you want a detector that can handle both dry and wet hunting it’s one of the best options. It’s not perfect though. The AT Pro doesn’t include a true all-metal mode, although it still provides great depth and reactivity for a mid-range VLF detector. It also doesn’t have some of the advanced features of the XP DEUS, such as a wireless design. Despite these issues, the AT Pro is one of the best all-round detectors on the market - and it provides great value for money. If you want a detector that’s just as comfortable in your local park as on wet sand, but can’t afford the XP DEUS, this is probably the one to buy. Note: The stock headphones included with the AT Pro are not waterproof. You’ll need to buy submersible headphones separately. Waterproof Headphones. If you’re planning to go into the ocean, waterproof headphones are essential. The headphones also need to block external sound, so you can hear faint signals over wind, waves and other beach users. Sand Scoop. The right scoop depends on your preferences and hunting location, but I always recommend spending a bit more on a quality tool. Keep in mind that a dry sand scoop has a different shape to those designed for wet sand. Longer handles can also reduce back strain but are less comfortable to carry. Shoulder or Hip Harness. A shoulder or hip harness can reduce the strain on your arm - especially if you’re using a heavy detector and coil. If you’re planning to hunt all day at the beach, I consider this an essential item. Finds Pouch. A zippered pouch for carrying recovered targets is essential. Make sure it’s secure - especially if you’re hunting in water. Pinpointer. Once your detector has found a target, a pinpointer can save time by narrowing the search area. Pinpointers are less important at the beach, as sand is easier to dig than soil. I still recommend taking a waterproof model with you though. 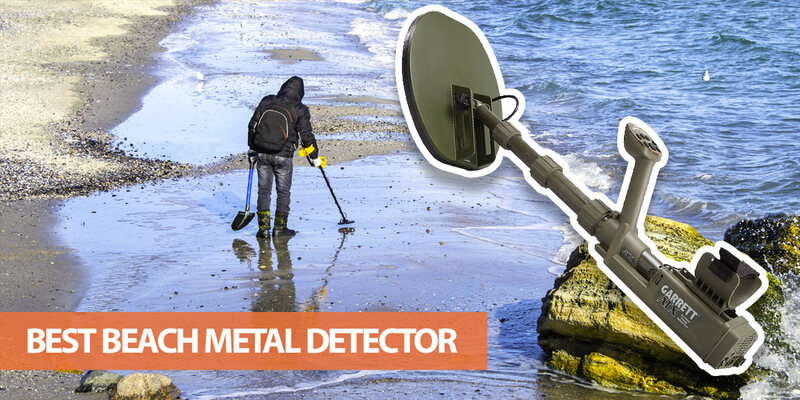 Beaches are a great place to find hidden treasure - especially if you've chosen one of the best metal detectors for beach hunting on this list. The combination of tides, sand and constant stream of people mean there are always new targets to find. While you’ll dig up plenty of junk, beaches are often hotspots for finding jewelry. Of course, if you can find the owner then you should return the item - but this isn’t always possible. A waterproof detector - even one that’s fully submersible - is not necessarily suitable for diving. Most waterproof models are only safe to use at depths of up to 10 feet. That’s too shallow for shipwrecks or scuba diving. Beach hunting can be a relaxing hobby with the potential for valuable finds. With targets being replenished on a near-daily basis, you never know what treasure you could uncover. It’s vital to choose a high-quality beach metal detector though - especially if you’re going to be hunting beaches regularly. Saltwater can play havoc with VLF detectors, making it almost impossible to distinguish real targets from background chatter. The right option also depends on your experience, budget, whether you want to go diving with the detector, and if you need a submersible model. For this reason, read each review and thoroughly research a detector’s specification before you buy. 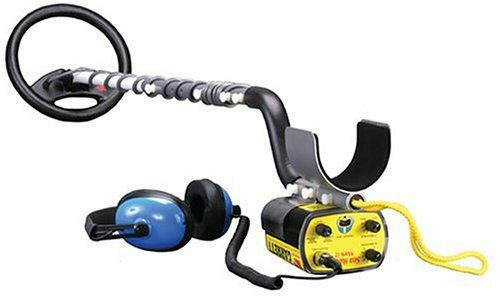 Do you have any questions about choosing the best beach metal detector? Or do you think there’s a model I should add to this list? Let me know in the comments section.